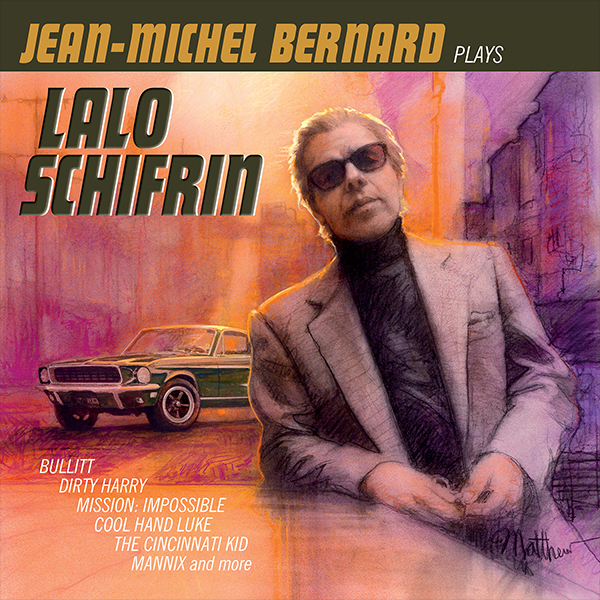 Howlin' Wolf Records: SIX STRINGS: VARÈSE SARABANDE: JEAN-MICHEL BERNARD "PLAYS LALO SCHIFRIN"
VARÈSE SARABANDE: JEAN-MICHEL BERNARD "PLAYS LALO SCHIFRIN"
The result of a concert performed by Jean-Michel Bernard celebrating the music of legendary composer Lalo Schifrin at the 2016 La Baule Film Music Festival in France, Varèse Sarabande will release a new studio recording of JEAN-MICHEL BERNARD PLAYS LALO SCHIFRIN digitally and on CD October 6, 2017. The album features three piano duets performed by Bernard with Schifrin himself! Lalo Schifrin calls Jean-Michel Bernard his ‘soul brother.’ The two first met over 25 years ago, but it wasn’t until they were reacquainted in 2016 that they would strike up a musical friendship. Schifrin was the guest of honor at the 2016 La Baule Film Music Festival. Bernard was asked to give a tribute concert to celebrate the Maestro, and re-orchestrated Lalo’s themes for the performance. Though not originally scheduled to – Bernard invited Lalo to join him on stage and the two played 35 minutes of amazing improvisations, culminating in Schifrin’s beloved “Mission: Impossible”. Inspired by the music of Schifrin and determined to recreate the historic moment by recording his arrangements for this album, Jean-Michel began recording this album – featuring Lalo’s beloved music from Mannix, Cool Hand Luke, Bullitt, The Cincinnati Kid, The Cat, the Dirty Harry Suite (featuring composer – and Clint’s son – Kyle Eastwood on electric bass), plus a melodic trip to Lalo’s roots with pieces like Lalo’s Bossa Nova and Tango Del Atardecer. After an initial recording session in France, Lalo invited Jean-Michel to Los Angeles to record a series of duets at the legendary Capitol Studios where Lalo would join him for three pieces. Take a musical adventure with this delightful new recording JEAN-MICHEL BERNARD PLAYS LALO SCHIFRIN. Perhaps Schifrin himself summed it up best, "In La Baule, it was a magnificent child. From now on, it's an adult." Paying homage to a composer... that is and always shall be "LALO SCHIFRIN"!